U.S. President Donald Trump and Russian President Vladimir Putin shake hands at the beginning of a meeting at the Presidential Palace in Helsinki, Finland, Monday, July 16, 2018. 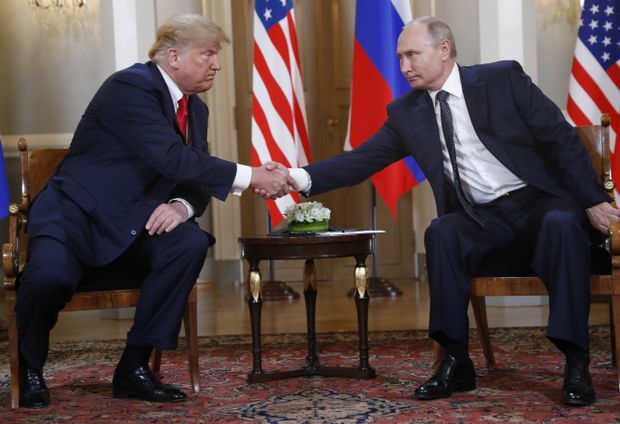 U.S. President Donald Trump opened his summit meeting with Russian President Vladimir Putin by declaring that “the world wants us to get along” and hinting that the two men would work toward an agreement to reduce the size of their nuclear weapons arsenals. “I think the world wants to see us get along. We are the two great nuclear powers. We have 90 per cent of the nuclear — and that’s not a good thing, it’s a bad thing — and hopefully we can do something about that,” Mr. Trump said shortly after shaking hands with Mr. Putin at the start of their summit meeting at the Presidential Palace in the Finnish capital of Helsinki. The two leaders were scheduled to meet alone for 90 minutes, with only their translators present, before allowing their aides to join them for the second half of the three-hour encounter. One easy achievement would be to announce the extension of an existing arms control agreement, such as the New Strategic Arms Reduction Treaty (better known as New START), which is due to expire in 2021. The presidents sat on ornate blonde wood chairs, separated by small table with a white flower arrangement on it. Mr. Putin, whose late arrival in Helsinki delayed the start of the meeting by almost an hour, spoke first, briefly noting that the two men had many difficult issues to discuss. “The time has come to talk thoroughly about bilateral relations as well as various hotspots in the world. ... There are enough of them for us to start paying attention,” the Russian leader said, wearing a spotted black tie and reclining in his chair while Mr. Trump, wearing his trademark long red tie, hunched his shoulders and leaned forward. It was a list of topics that did not include the issues that many had expected to top the agenda, such as Russia’s annexation of Crimea, its support for separatist fighters in eastern Ukraine, the war in Syria, and allegations of Russian meddling in the 2016 U.S. election. Mr. Trump made clear his desire to improve ties with Mr. Putin’s Russia. Earlier in the day, Mr. Trump embraced one of Mr. Putin’s key narratives by blaming U.S foreign policy — rather than Russian actions — for the plunging relationship between Washington and Moscow. “Our relationship with Russia has NEVER been worse thanks to many years of U.S. foolishness and stupidity and now, the Rigged Witch Hunt!” Mr. Trump tweeted just before the meeting began. Mr. Putin has been making a similar argument for years, saying it was U.S. actions — including the wars in Kosovo and Iraq, as well as the expansion of NATO into Eastern Europe — that brought an end to the post-Cold War détente between Washington and Moscow. Most in the West see Russia as the main antagonist, pointing chiefly to its 2008 war against Georgia, the 2014 seizure and annexation of Crimea from Ukraine, and Moscow’s military support for Syrian dictator Bashar al-Assad. Some observers were concerned about Mr. Trump’s decision to meet alone with Mr. Putin at the start of the summit, worrying that Mr. Trump would make concessions to the Russian leader without his advisers there.